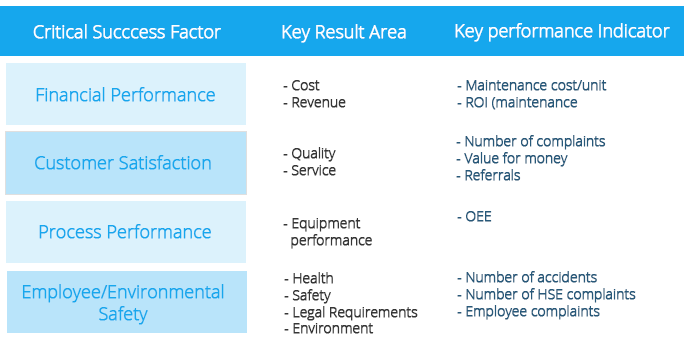 As the adage goes, you can’t improve a process without first measuring its performance, but what are the most important maintenance KPI metrics you should measure? Establishing a baseline for success should be the first step whenever you set out to improve something. Bill Gates draws the example of the steam engine – one of the biggest advancements in the industrial age, as being a product of incremental design changes and precise feedback, as opposed to one Eureka! – type moment. “Without measurement,” writes William Rosen, invention is “doomed to be rare and erratic.”With the steam engine, the criteria is fairly straightforward. A superior design would have some combination of being lighter, more powerful, more fuel efficient, cheaper to construct, etc. Minimizing downtime might seem like a worthy goal, but not if it also has a negative impact of product quality or employee morale. Or, if it jeopardizes a longer term strategy of increasing the proportion of preventive/reactive maintenance. When optimizing the department there are dozens of confounding factors to be considered. The struggle then becomes which maintenance metrics to focus on. The balanced scorecard approached was first introduced in the early 1990’s and encouraged managers to track performance using a variety of metrics. The central idea is to avoid optimizing one area at the expense of another. Increasing machine availability by stocking an excessive number of spare parts – OEE improves, but inventory costs skyrocket as well. The age-old practice of measuring performance based solely on financial indicators alone has been found to be inadequate and missing the whole picture. Hence, a new school of thought has emerged that reconciles high-level financial measures with more practical day-to-day key performance indicators (KPIs). This holistic approach to maintenance brings the organization one step closer to integrating maintenance with other high-level goals and promotes the idea that maintenance metrics should be viewed as an input to production instead of a necessary waste.